Issues for the Anglo-Maltese League, Malta Relief Fund, MMDNA (Malta Memorial District Nursing Association) and Singer Sewing Machine Co are listed under Labels. Acknowledgments for the Malta section can be found at the foot of this page. 1975-88. Aeroplane tail and Maltese cross. 23½ x 20½ mm. Perf 13½. Wmk Multiple Maltese crosses. Value shown as '£M1' on A1, or as 'LM2' on A2. Designed by Anthony Agius and printed by Printex Ltd in sheets of 200 (4 panes of 50). 1. The design information, printing details and issue date for A1 are given by Smeed. The issue date for A2 is as reported in 1989 in Melita (the Newsletter of the Malta Study Circle). Another report in Melita (1982) notes that the £1 stamps were withdrawn from sale at the Post Office on 1 October 1980, though it is not clear whether they remained in use at the airport after this date. 2. 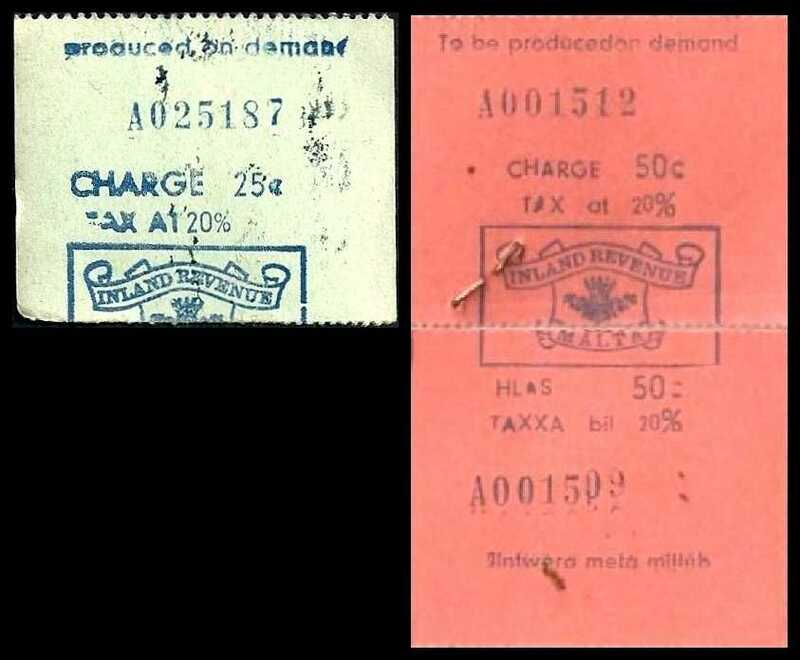 The above stamps replaced larger (90 x 73 mm) paper labels inscribed either Department of Civil Aviation Malta Passenger Service Charge (5s and 6s values) or Government of Malta Civil Airport Passenger Service Charge (6s, 10s and decimal 50c). An example of the latter type is illustrated at right. Further details of these labels will be found in David Springbett's book on airport departure tax, due to be published shortly. 1925. Unappropriated key type as Revenue R43, but overprinted APPLICATIONS at foot. Perf 14. Wmk Multiple Script CA. Printed (typo) by De La Rue in sheets of 240. 1925-26. Unappropriated key types as Revenue R41ff, but overprinted CONTRACTS at foot. Perf 14. Wmk Multiple Script CA. Printed (typo) by De La Rue in sheets of 240 (penny values), 168 (shilling values) or 120 (pound values). Note: the existence of a 2s on yellow paper is known from the Crown Agents Requisition books and archival proof material but this has not been recorded as an issued stamp, and Wood (2009) suggests that it was perhaps never issued. Note: this section was formerly headed Excise but was renamed in August 2016 when the section on Tobacco and Alcohol Excise stamps was added to the Malta chapter. ​1953-70 (recorded usage). Entertainment excise duty printed directly onto tickets for the theatre, cinema or sporting events. 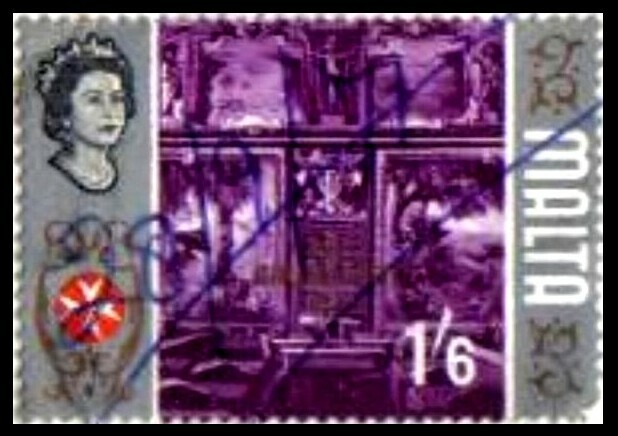 Crown and scrolls design in rectangle (similar to Excise adhesive revenues of Great Britain), 23 x 15 mm. 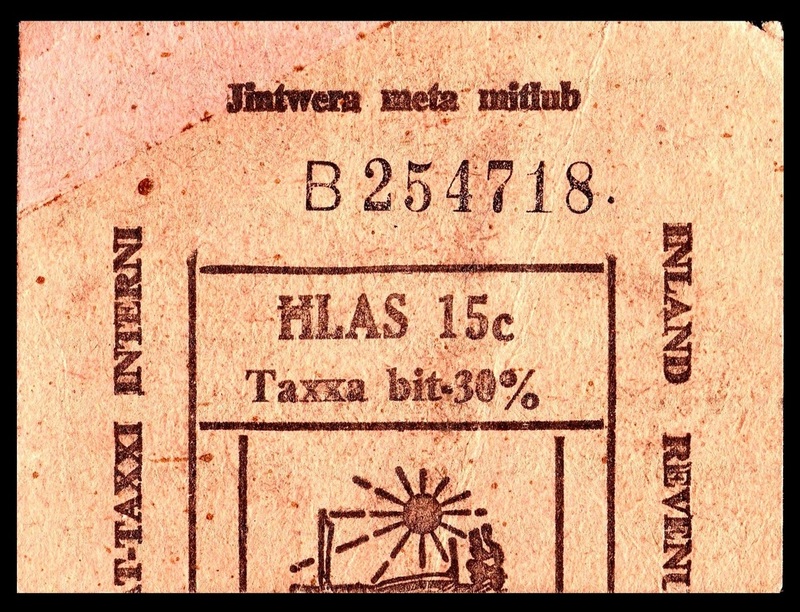 Inscribed EXCISE REVENUE in upper scroll, value in words in lower scroll with value in figures either side, MALTA in upper left and lower right corners of rectangle. 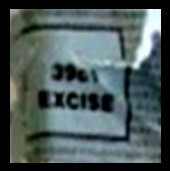 The price of admission and the amount of tax are printed on the ticket, reading upwards at either side of the rectangle. Used tickets are left- or right-hand halves only, the other half being retained by the cinema. Note: E12 has not yet been recorded without the handstamped surcharge. Note: E29 has not yet been recorded without the handstamped surcharge. 1971 (recorded usage). Similar type (51mm wide) but inscribed INLAND REVENUE in upper scroll, MALTA in lower scroll. The admission price and the tax are left blank, to be inserted by handstamp at the time of sale. Note: this blank type of ticket allowed for variations in both the admission price and the rate of tax. The example shown here (dated August 1971) is the only one I have seen to date, but I suspect that other tickets exist handstamped with different prices. 1971 (recorded usage). New type, vertical format 51 mm wide showing Arms of Malta. 1977 (recorded usage). Similar to E51 but in decimal currency and showing the percentage tax paid rather than the admission price. 1976-85 (recorded usage). Decimal currency issue, arms of Maltese Republic in centre. Inscribed INLAND REVENUE DEPARTMENT / CHARGE, plus the percentage tax paid, all in both English and Maltese. Used tickets are upper or lower halves only, the other half being retained by the cinema. Note: this essay for a one shilling impressed stamp, dated 19th October 1923, was sold by Spink in January 2014 along with a similar essay for a ¼d value. Both essays were marked 'Approved', though no examples of the issued stamps have been recorded to date, and it is possible that the essays were not in fact adopted. 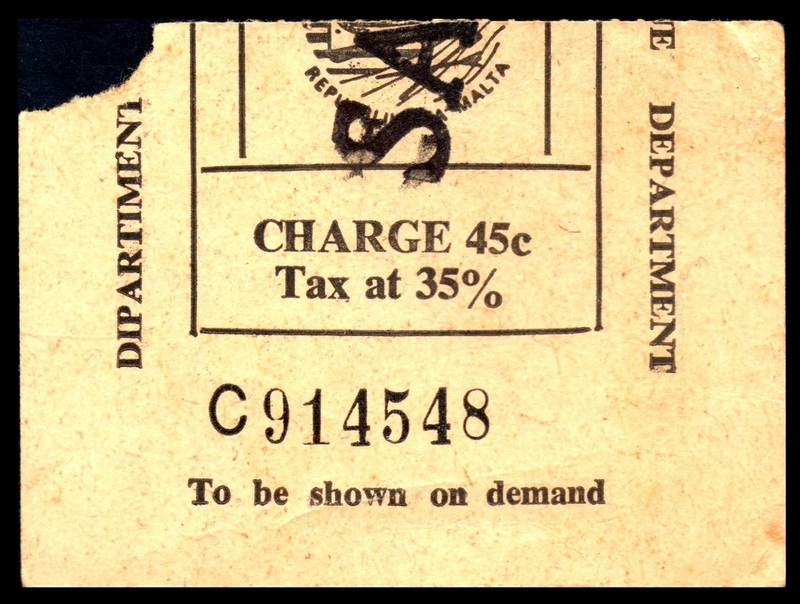 1922-64 (recorded usage). Imperial crown and Maltese cross. 17 x 28 mm (1d) or 30 x 30 mm (2d). Date plugs with year at foot. The range of recorded use of each value is shown in brackets. ​Note: essays are known for both values, dated 20th March 1918 (Z1) and 11th April 1932 (Z2). Both were approved immediately, and the stamps were probably issued soon afterwards. 1966-71 (recorded usage). As previous issue but with castle turret in place of crown at top. 30 x 30 mm (2d) or 18 x 29 mm (4d). 1. Barber lists a 1d vermilion in the same design but I have not seen this. 2. Carmel Axiaq has found an albino example of Z11 (illustrated at right) but this seems to be an error rather than a regular production. 1973 (recorded usage). As Z12 but change to decimal currency. Impressed stamps were discontinued in the late 1970s or soon after. 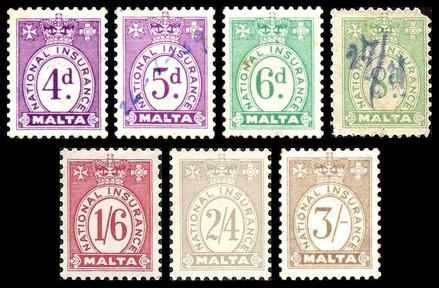 Duty was subsequently collected using non-embossed stamps printed on each cheque, normally in the same colour as the rest of the design (eg black for Bank for Valletta cheques, green for Lombard Bank, black or red for Mid-Med Bank). Two different values are known, with the 1c7 occurring in either 15mm or 12mm diameter. Earliest recorded usage is as follows: 1c7 (15mm) (1976), 1c7 (12mm) (1983), 2c (1985). 1919 (earliest recorded usage). The Singer Sewing Machine Company (Italy) Ltd. Inscribed 'For Hire of a Sewing Machine'. 49 x 17 mm. Roulette 12½ x 5½, imperf at sheet edges. No watermark. Serial number machine-stamped in black. 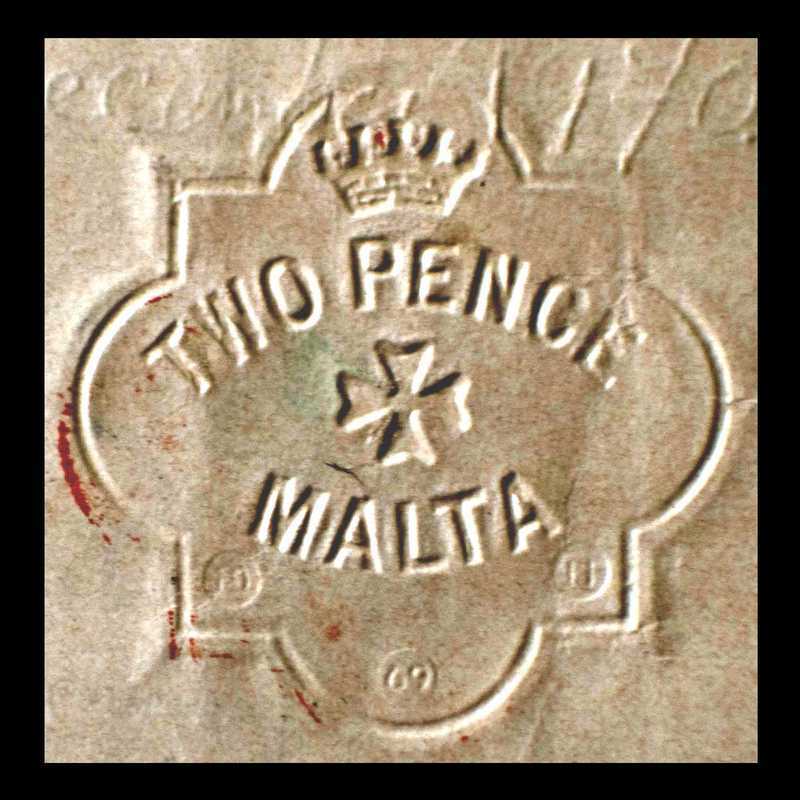 Note: although this design does not feature the country name, these adhesives can be identified as Maltese by the use of sterling currency and the serial number prefix M. Similar labels denominated in other currencies were used in other countries. 1937-44. 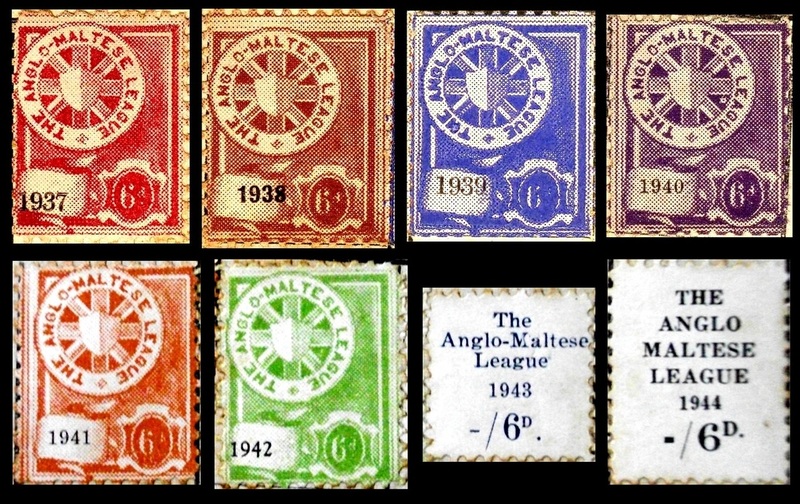 The Anglo-Maltese League. 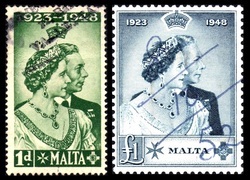 Original design (1937-42) showing Union flag in circle with Maltese shield in front, and year of validity printed in black at lower left. Simple typeset designs for 1943 and 1944 issues. No watermark. 1941. 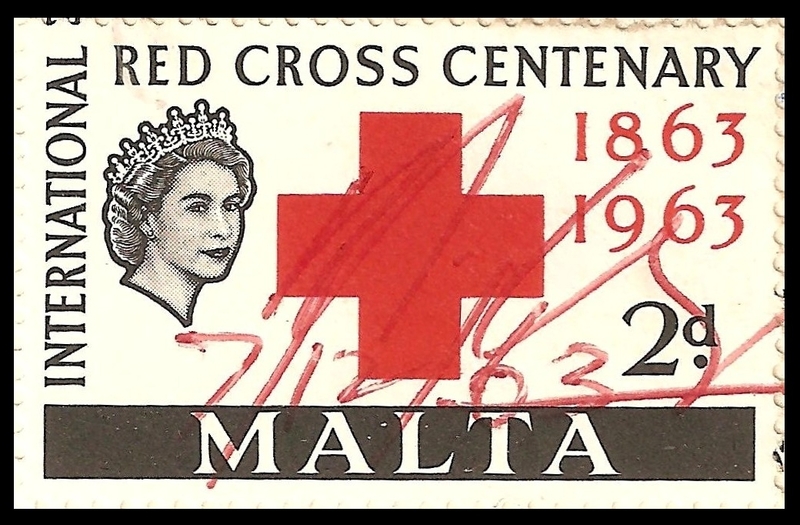 Design featuring V (=Victory), inscribed 'Help the Malta Relief Fund'. Perf 11. No watermark. Note: the issue of this label was advised in the Malta Government Gazette (no 8895) on 31st October 1941. It was withdrawn from sale as of 13th October 1945 (advised in Gazette no 9364, 10th October 1945). 1948. Nurse and Maltese cross, inscribed M.M.D.N.A. (=Malta Memorial District Nursing Association). 26½ x 35½ mm. Perf 12½. No watermark. Printed (recess) by Waterlow, printer's imprint at foot of stamp. 1. The MMDNA was founded shortly after the War, and began offering home nursing services in 1947. The stamps listed above were presumably issued to collect the annual membership fee. 2. The earliest recorded example of L42 is on an Associate Card dated 25 March 1948. 3. A printer's sample of the 5s is known in blue (see illustration at right), handstamped WATERLOW & SONS SPECIMEN. c1956. Workmen's Compensation stamp surcharged N.I. and new value in black or red. Note: examples of N1, N2 and N4 plus an unrecorded 6d on 1d green (surcharged in black) were in the collection of cinderella philatelist Conrad Graham, which was sold by Grosvenor in April 2015. These values were not illustrated in the auction catalogue, and I am unaware who bought the very large lot which included them. If the new owner could send me a scan, I would be very grateful! 1956-66. 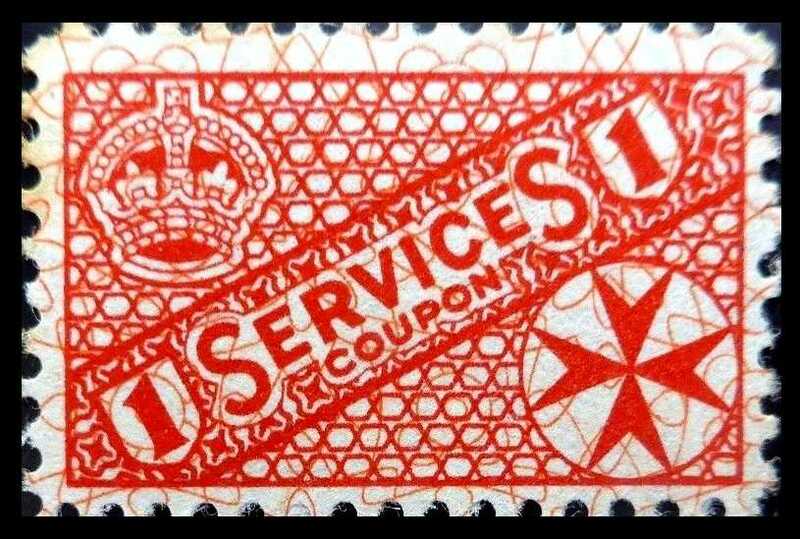 Small numeral type similar to Workmen's Compensation stamps, but with George Cross in top right-hand corner and inscribed NATIONAL INSURANCE in circle surmounted by crown. 13 x 17½ mm. Perf 14 x 13½. Wmk Multiple Script CA. Printed (recess) by Perkins Bacon / Harrison in sheets of 120. Note: the values shown in brackets are known from the Crown Agents Requisition books but I have not seen them as issued stamps, other than the 3s4d with provisional surcharge (see N57 and N61 below). Note: the last three of the above printings are listed in Grasham and Wood's book (page 25) as No crown, but Wood has advised me in private correspondence that this is an error. 1. Barefoot lists the following values which I have not seen: 5d on 6d, 1s10d on 6d, 3s2d on 2s, 9s on 2s; plus 9s on 3s with SE overprint similar to N81. He does not indicate whether these values belong to this set or to the later series (N56/61 or N71/72). 2. ​Recorded usage: 1961 (N35). 1966-70s. Similar type but without crown at top, and wmk changed to Multiple Maltese Crosses. Perf 14 x 13½. 1. The 1s6d and 2s are known from the Crown Agents Requisition books but I have not seen them as issued stamps, though the 1s6d is known surcharged (see N71 and N76 below). 2. The 8d and 1s8d values are not listed in the Requisition books, and were presumably issued after 1970, when the books end. It is possible that other new values may have been issued after 1970. 3. Barefoot lists a 4s10d orange though this may be an error for the surcharged stamp (N73). 1964 (earliest recorded usage) - 1970s. Previous issues surcharged locally, the letters N.I. being in a wider font than on N31/5 above and with less pronounced serifs. c) As b) but without N.I. ​Recorded usage: 1964 (N56), 1965 (N57), 1968 (N58). 1973-74 (earliest recorded usage). As 1966-70s issue but denominated in decimal currency and additionally surcharged. 1. It is presumed that these values were originally issued without surcharge but they have not yet been recorded as such. 2. N81 and N91 are known used together on a National Insurance card (illustrated in Grasham and Wood), N81 being used in August-September 1973 and N91 in June 1974. 1976 (recorded usage). 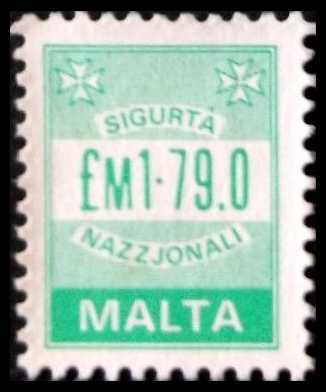 New slightly smaller type (13 x 16½ mm) inscribed Sigurtà Nazzjonali in Maltese. Perf 14. Watermark Multiple Maltese Crosses. Note: A National Insurance card is known bearing five examples of N102 used between 3rd May and 21st June 1976. The same card refers to a 91c5​ stamp, though no examples of this value have otherwise been recorded. 1933-62. Numeral type inscribed FEE PAID (above value tablet) and PASSPORT at foot. 18 x 22½ mm. Perf 14. Wmk Multiple Script CA. Printed (typo) by De La Rue in sheets of 60. Note: P9a is thought to emanate from the final (October 1967) printing of Passport stamps; the £1 may also exist perf 12½ x 14 from the same printing. A note in the Requisition books suggests that the October 1967 printing may have been on block CA paper, though this cannot be confirmed at present since the only recorded example of P9a has an indistinct watermark. 1969. Similar type but inscribed FEE PAID at foot, without PASSPORT. Perf 12½. Watermark Multiple Maltese Crosses. 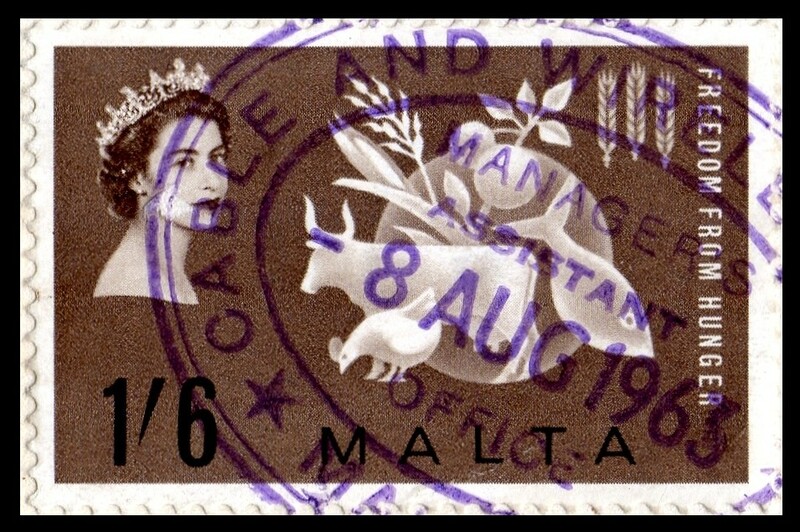 Note: to date these are the only values known to have survived from a set of consular stamps sent to Malta on 13th November 1968 (Crown Agents Req 8/01295/1). This requisition also included the following seven values, none of which I have seen as issued stamps: 1s6d, 2s, 2s6d, 3s, 7s6d, 10s, 22s6d. According to Wood (2011), passport stamps were withdrawn from use on 15 May 1972 and became invalid the following day with the introduction of decimal currency. 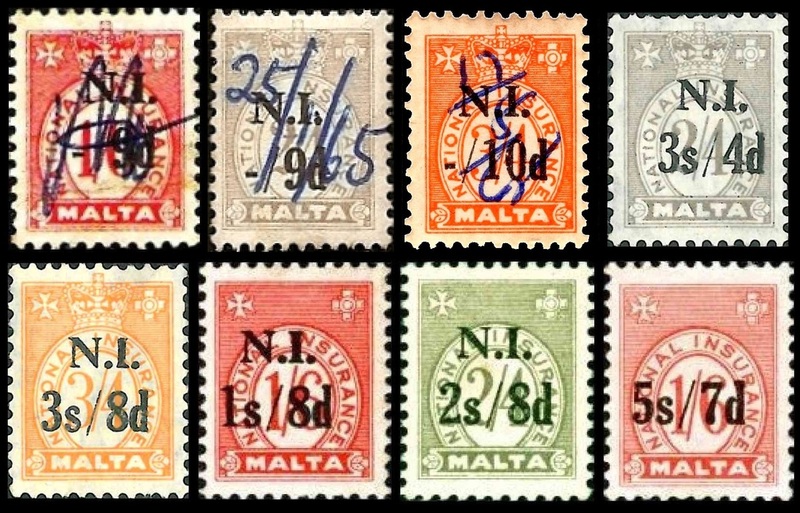 Illustrated above are two British postal orders overprinted for use in Malta. The first order (KGVI portrait) has a face value of one shilling uprated with a pair of 2d postage and revenue adhesives, and poundage of 2d has been collected. The QEII order shows a face value in sterling (5 pence) with a poundage in Maltese currency (2c 5m). 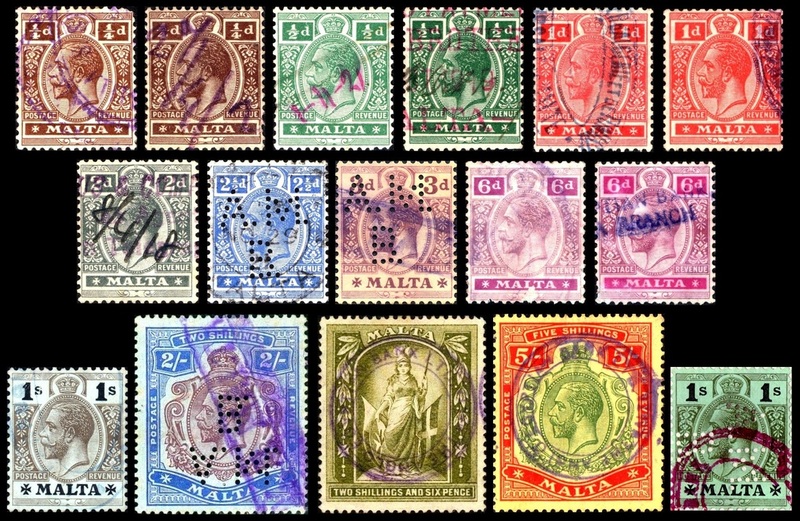 British postal orders were issued in a wide range of values and it is likely that many of these were overprinted for Malta. Such items are not listed on this website but further information can be obtained from the Postal Order Society. 1944. Coupons for clothing ration. Crown over numeral, 11 x 14 mm (½ coupon) or crown over George Cross, 24 x 14 mm (1 coupon). Imperf. Watermark Multiple Crown and letters SO (=Stationery Office, as on United Kingdom Excise issues). Issued in sheets of 21 (½ coupon x 6 se-tenant with 1 coupon x 15), all the coupons in one sheet being printed the same colour. A complete booklet contained four normal sheets (K21/8) plus four spare sheets (K31/8). Security background of geometric patterns printed in pale grey. This listing follows the sequence of ration book page numbers, ie the first page of coupons (page 3) contains K21 and K25, page 4 contains K22 and K26 etc. ?1940s. Similar types with crown and cross, but now perforated (perf 12) and inscribed Services in central banner. Watermark Multiple Crown and SO. Security background of geometric patterns printed in orange. 1946. As K21 etc but new design of Maltese cross in circle surmounted by crown. All coupons now in vertical format, 1 coupon measures 14 x 25 mm. Imperf. Watermark Multiple Crown and SO. Sheet and booklet format as before. Security background of geometric patterns printed in second colour listed. 1925. Unappropriated key type as Revenue R41, but overprinted REGISTERS at foot. Perf 14. Wmk Multiple Script CA. Printed (typo) by De La Rue in sheets of 240. 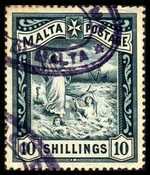 Only one printing: Req 5315, sent to Malta 27th August 1925. 1899 (9th August). 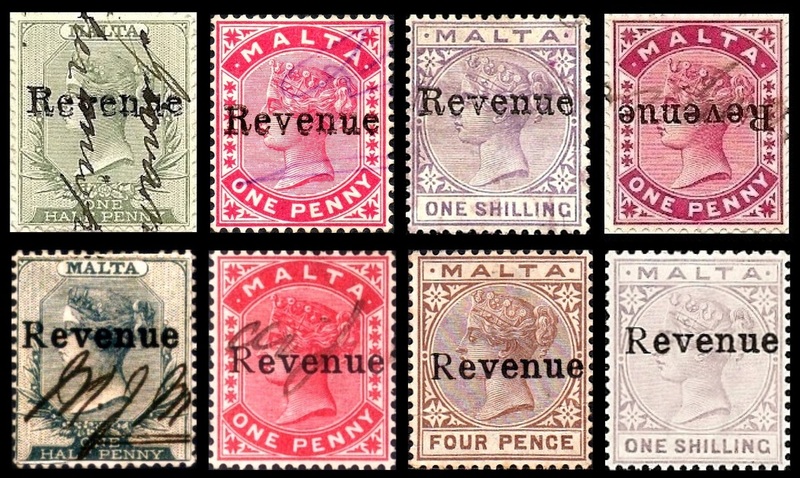 Postage and revenue definitives (Queen Victoria portrait), overprinted Revenue in mixed case, 17 mm long, by the Government Printing Office, Valetta. Perf 14. Wmk Crown CC (5s) or Crown CA (others). 1. The date of issue is as announced in Malta Government Notice #218 (quoted by Smeed). 2. The 'straight tail to R' variety can be found se-tenant with normal. 1899 (November) - 1902. As previous issue but now overprinted REVENUE in capitals by De La Rue in London. ½d to 1s with portrait of Queen Victoria, overprint 15½ mm long, wmk Crown CA. 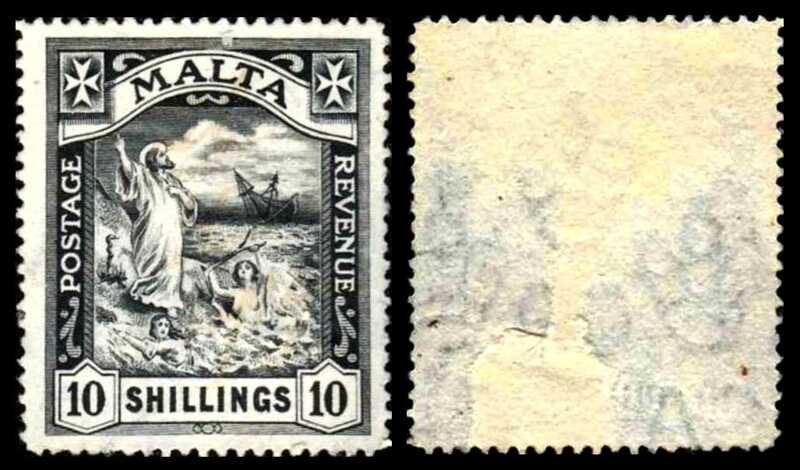 Higher values larger (2s6d emblematic figure of Malta, 5s Queen Victoria, 10s Shipwreck of St Paul) with overprint 20 mm long, wmk Crown CC. 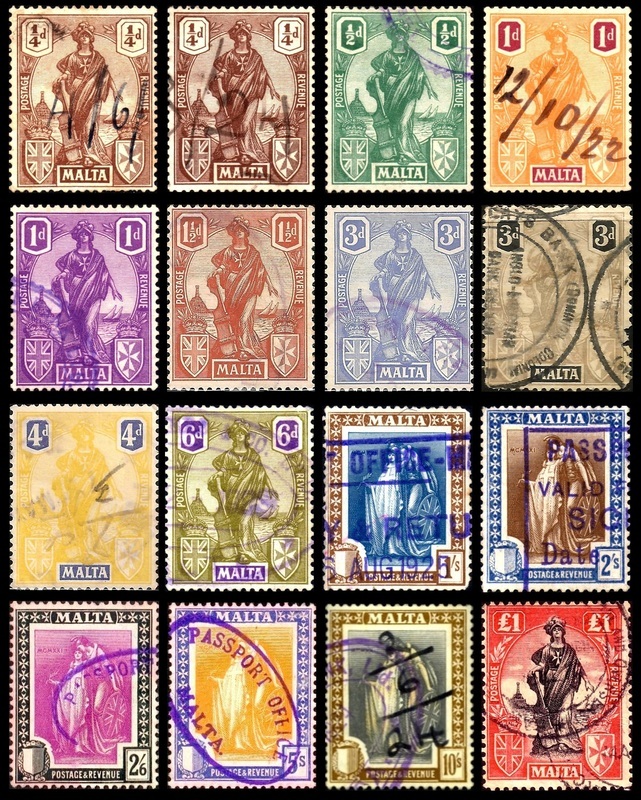 The basic set supplemented by four additional values produced by surcharging special printings in previously unissued colours of the 2s6d (2s) or the 1s (others), with Revenue overprints in slightly different fonts and bars through original value. 1. Smeed quotes an unattributed suggestion that the ½d, 1d, 4d and 1s were put on sale in Malta on 17th November 1899. 2. 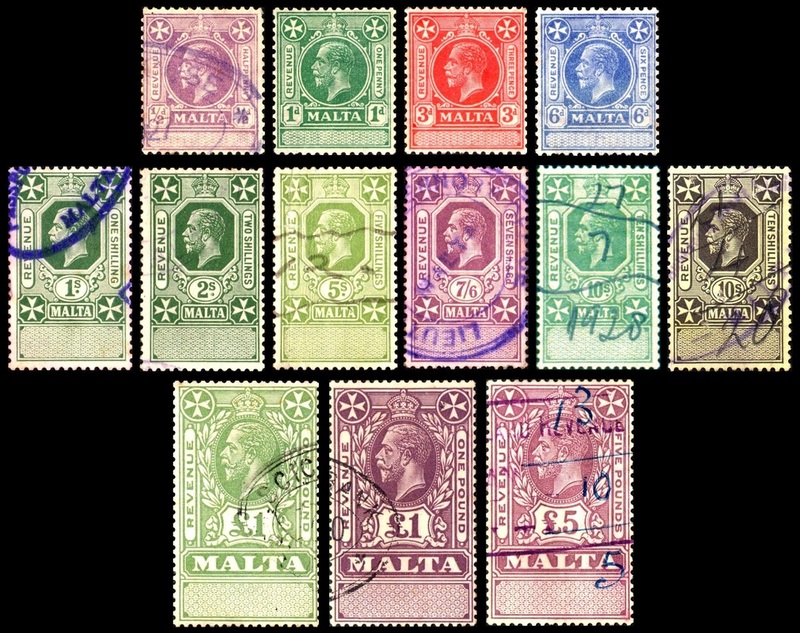 The 2d, 3d, 6d, 9d and 2s to 10s were printed at the end of 1901 and probably put on sale in Malta in early 1902 (so Smeed). These eight values are known with Specimen handstamp. A top value of £1 was originally commissioned by the Crown Agents, but cancelled following advice from De La Rue that the production of a £1 stamp by surcharging a lower value might invite forgery. 3. 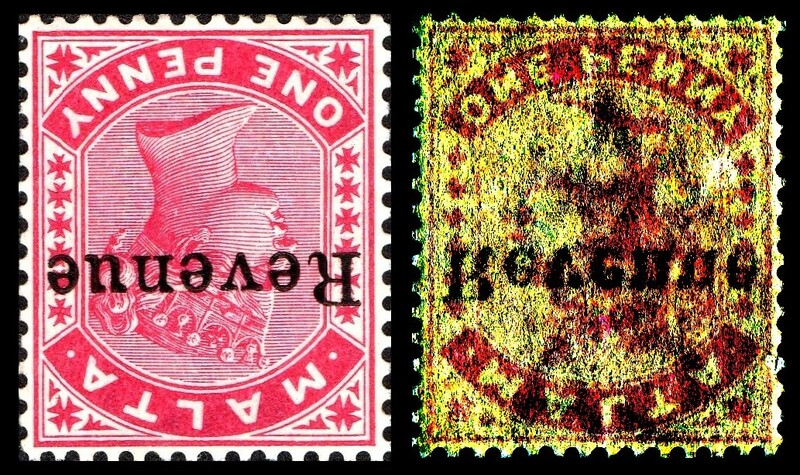 A set of three surcharge proofs for the 3d, 6d and 9d (see illustration above right) was sold by Spink in January 2014.
c1904. 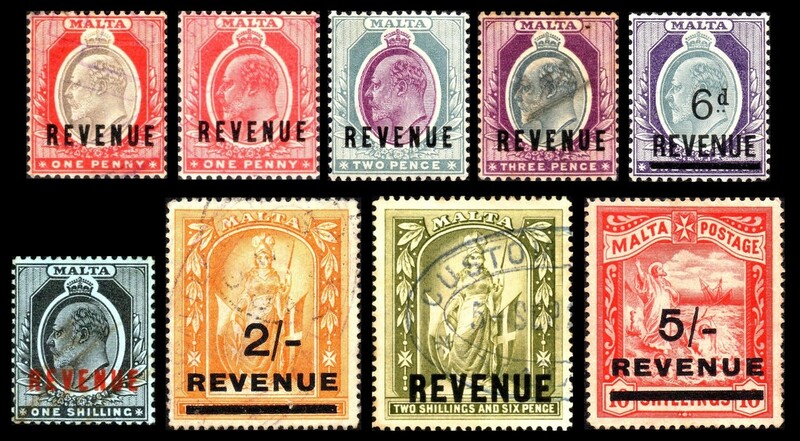 Postage and revenue definitives (King Edward VII portrait), locally overprinted Revenue in mixed case. Perf 14. Wmk Crown CA. 1904-12. As previous issue but now overprinted REVENUE in capitals by De La Rue in London. 2s and 2s6d similar to R19/20 but with change of watermark. New value (5s) added by surcharging special printing of 10s value in previously unissued colour, with bar through original value. Perf 14. Wmk Multiple Crown CA. 1. The 2d, 3d, 6d and 1s are known with Specimen handstamp. 2. The 3d value was not issued in this watermark without Revenue overprint. 1925-30. Unappropriated key types, portrait of King George V. 18½ x 22 mm (pence values), 18 x 31 mm (shilling values), 22½ x 38 mm (£1 and £5). Blank tablet at foot. Perf 14. Wmk Multiple Script CA. Printed (typo) by De La Rue in sheets of 240 (penny values), 168 (shilling values) or 120 (pound values). 1. The existence of a 2s on green paper is known from the Crown Agents Requisition books and archival proof material but this has not been recorded as an issued stamp, and Wood (2009) suggests that it was perhaps never issued. ​2. The Requisition book includes the note "change of colour" against the £1 from the 1929 printing, though does not specify what the new colour was. The colour had already been changed to purple on yellow in August 1926, and my guess is that the 1929 printing was actually a change back to green, perhaps occasioned by the need to avoid confusion with the new £5 purple from the same printing. 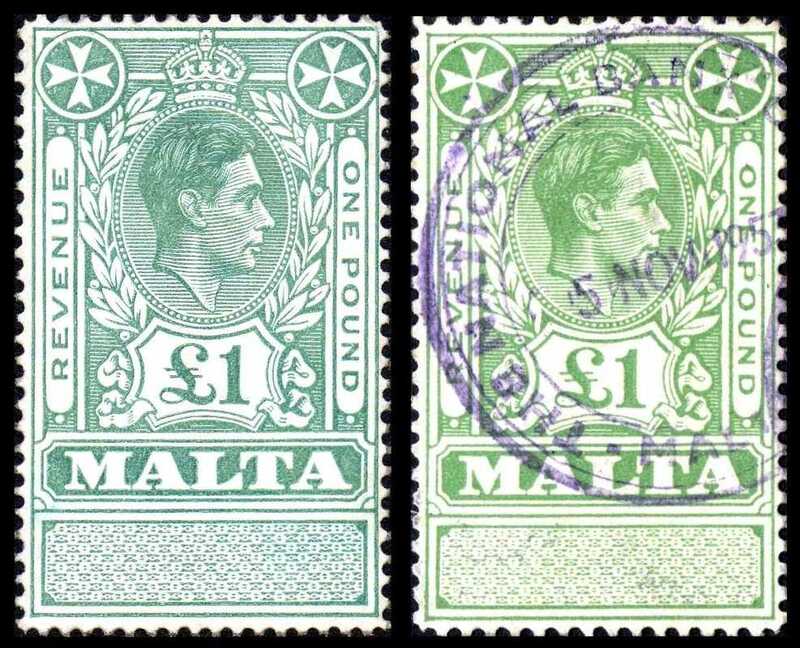 Green was presumably used again for the 1936 reprint of the £1, and then would have been the obvious choice when the King George VI stamp was subsequently introduced (see R61/2 below). 1941-48. As previous issue but portrait changed to King George VI. 22½ x 38 mm. Blank tablet at foot. Wmk Multiple Script CA. Printed (typo) by De La Rue. Ordinary paper (R61) or chalk-surfaced paper (R62). 1954. Portrait again changed to Queen Elizabeth II. 22½ x 38 mm. Blank tablet at foot. Perf 14. Wmk Multiple Script CA. 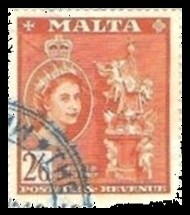 Only one printing: Req 5706/1, sent to Malta 25th June 1954. Note: for ease of reference, numbering follows the Stanley Gibbons Part 1 (Commonwealth / British Empire) catalogue throughout this section. Values listed here are those recorded as having been used for revenue purposes. For perforation, watermark and printing details of commemorative issues listed in this section, please refer to the Gibbons catalogue. 1882-84 and 1885-90. Portrait of Queen Victoria. 18½ x 22½ mm and wmk Crown CA (½d to 1s), 25 x 30 mm and wmk Crown CC (5s). Perf 14. Printed (typo) by De La Rue. ​1899-1901. Shipwreck of St Paul. 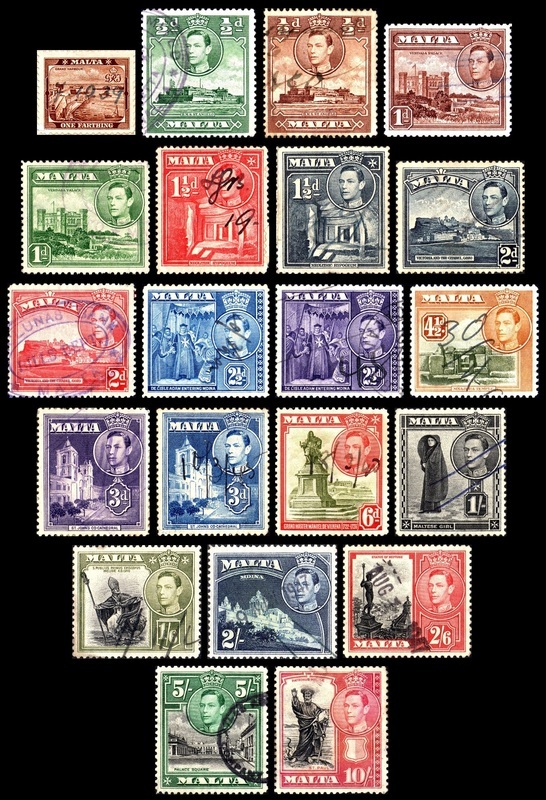 Inscribed MALTA POSTAGE in upper banners. 25 x 30 mm. Perf 14. Wmk Crown CC. Printed (recess) by De La Rue. Note: this stamp is inscribed POSTAGE, and was originally valid for fiscal use only with REVENUE overprint (see R22). Around 1912-13 the issue of dedicated revenue stamps was suspended and all postage stamps became valid for both postage and revenue purposes. F35 remained in use until it was replaced in 1919 with a new 10-shilling stamp inscribed Postage (and) Revenue. 1903-14. Fishing boat (4½d) or King Edward VII portrait (others). Perf 14. Printed (4½d recess, others typo) by De La Rue. 1914-21. King George V portrait or emblematic figure of Malta (2s6d). Perf 14. Watermark Multiple Crown CA. Chalk-surfaced paper (3d to 1s and 5s). Printed (2s6d recess, others typo) by De La Rue. 1917-18. King George V portrait stamp overprinted War Tax in sans-serif capitals by De La Rue. Wmk Multiple Crown CA. Perf 14. 1919. 10s similar to F35 but in new frame inscribed Postage Revenue. Watermark Multiple Crown CA (for Script, see F104 below). Printed (recess) by De La Rue. 1921-22. Low values as 1914-21 issue and 10s as F96 but change to watermark Multiple Script CA. Printed (10s recess, others typo) by De La Rue. 1922. Earlier issues overprinted SELF-GOVERNMENT diagonally at the Government Printing Office, Valetta. Perf 14. 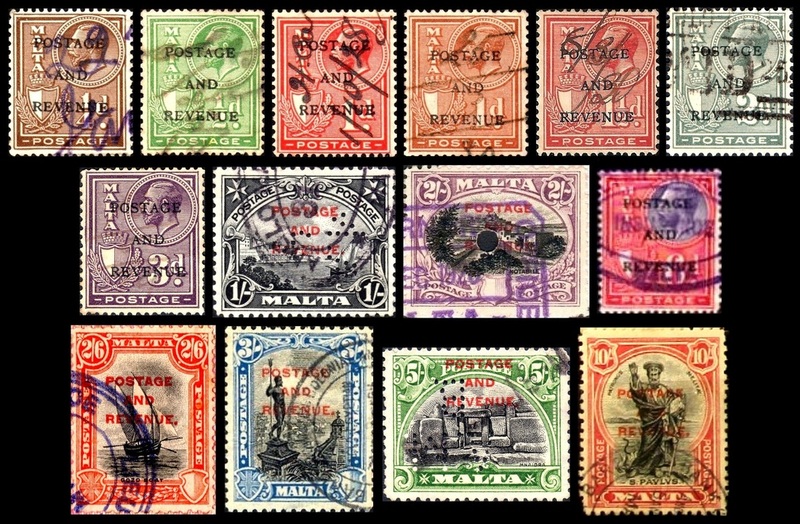 Note: F105 is inscribed Malta Postage (as F35) and F121 is inscribed Malta Postage Revenue (as F104). 1922. King George V portrait stamp surcharged in words at the Government Printing Office, Valetta. 1922-26. 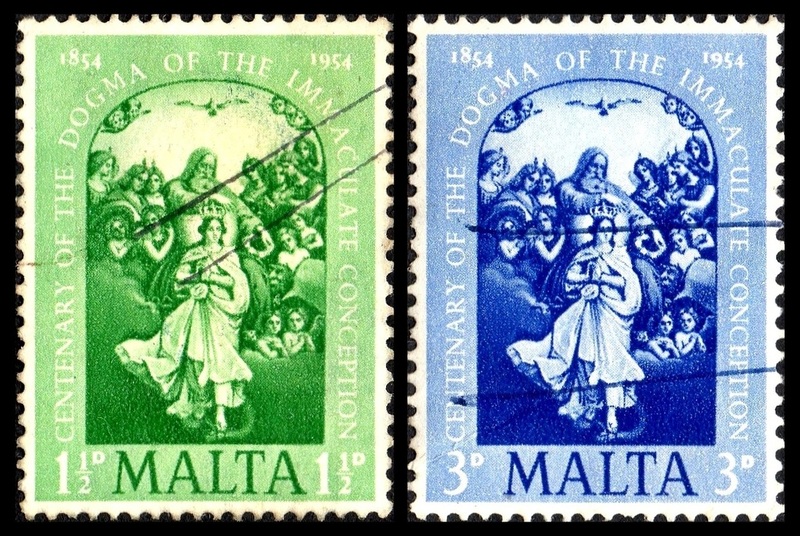 New pictorial issue featuring allegorical designs of Anglo-Maltese Union (shilling values) or Our Lady of Malta (others). Perf 14. Watermark Multiple Script CA (sideways on pence values, with crown to the left of 'CA' when seen from the back of the stamp). Printed (£1 recess, others typo) by De La Rue. 1928. King George V and pictorial types of 1926-27 (inscribed POSTAGE) now overprinted POSTAGE AND REVENUE. Perf 15 x 14 (pence values) or perf 12½ (others). Watermark Multiple Script CA. 1930. As 1926-27 issue but inscribed POSTAGE & REVENUE. Perf 15 x 14 (pence values) or perf 12½ (others). Watermark Multiple Script CA. Printed (pence values typo, others recess) by Waterlow. 1938-43. King George VI pictorial issue. Perf 12½. Watermark Multiple Script CA. Printed (recess) by Waterlow. 1948-53. As 1938-43 issue but overprinted (by Waterlow) SELF-GOVERNMENT 1947. Perf 12½. Watermark Multiple Script CA. 1949. Royal Silver Wedding commemorative issue. 1949. 75th Anniversary of Universal Postal Union. 1950. Visit of Princess Elizabeth to Malta. 1951. Seventh Centenary of the Scapular. 1954. Centenary of the Dogma of the Immaculate Conception. 1956-57. Queen Elizabeth II first pictorial issue. Perf 14 x 13½ (2s6d to £1) or 11½ (others). Watermark Multiple Script CA. Printed (recess) by Waterlow (2s6d to £1) or by Bradbury Wilkinson (others). 1957. George Cross Commemoration. Cross in silver. 1958. George Cross Commemoration. Cross in first colour, outlined in silver. 1960. 19th Centenary of the Shipwreck of St Paul. 1964. First European Catholic Doctors' Congress, Vienna. 1965-70. Post-Independence pictorial issue. Perf 14 x 14½ (½d to 6d) or 14½ (others). Watermark Multiple Maltese Crosses. Printed (photo) by Harrison. 1965. 700th Birth Anniversary of Dante. 1965. 400th Anniversary of the Great Siege. 1967. 25th Anniversary of the George Cross Award to Malta. 1967. 1900th Anniversary of the Martyrdom of Saints Peter and Paul. 1967. 300th Death Anniversary of Melchior Gafa. 1969. 50th Anniversary of the International Labour Organisation. 1969. Birth Centenary of Robert Samut. 1969. Fifth Anniversary of Independence. 1970. 13th Council of Europe Art Exhibition. 1971. National Plant and Bird of Malta. 1925-26. Unappropriated key types as Revenue R43ff, but overprinted STOCKS & SHARES at foot. Perf 14. Wmk Multiple Crown CA (5s black on red) or Script CA (others). Note: the existence of the stamps in brackets is known from the Crown Agents Requisition books and archival proof material but I have not seen them as issued stamps. Wood (2009) describes the 2s as having been printed on red paper rather than green - the Requisition book is not explicit either way - but suggests that it was perhaps never issued. 1930s-40s. Tobacco Excise issues under British administration. Coat of Arms in centre. 1. I have not personally seen X1/2, X5/6, X20 or X22/36 (below). Much of the information given here is derived from the ground-breaking article by Joe Scicluna (for full details see Acknowledgments at the foot of this page). 2. Scicluna also lists the 2d and 14d values similar to X1/5, with most values in this type appearing in more than one different colour combination. I would be very grateful to any reader who can supply images of these values. 1950s-72. 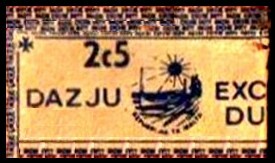 Long strips in various types, all inscribed DAZJU / EXCISE DUTY. Note: Scicluna additionally lists a 10d similar to X22 and a 10d similar to X32, neither of which I have seen. 1972-73. Rectangular type, 48 x 20 mm. Coat of Arms supported by dolphins, inscribed DAZJU / EXCISE DUTY. The 5c5 blue and the 11c have a security background of DAZJU EXCISE DUTY printed in very small letters. Note: Scicluna additionally lists a 10d (sterling currency) and a 5c in the same type, but I have not seen these. He states that the 11c is on green paper, and lists the 5c5 red on buff as well as on pink, though it seems to me that the paper used to print these issues is of variable shade and quality, and the reported differences may represent variations within one printing rather than distinct issues. 1976-89. New rectangular types with Republican Coat of Arms in centre. 1989. New types, 48 x 20 mm, with the new Coat of Arms in centre. Security background DAZJU / EXCISE DUTY printed in very small letters on all stamps. Note: Scicluna additionally lists the 67c1 similar to X81/98, but I have not seen this. c2005-2014. Printed on silver foil incorporating a security hologram. Security number printed at foot consisting of a letter and 10 digits (see note 1). No value indicated. 2. 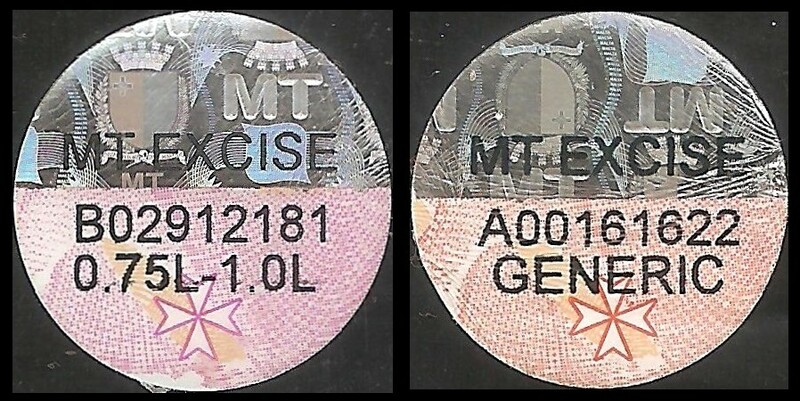 For similar labels but with the EXCISE DUTY PAID inscription in a single line, see X122/3 below. 2008-16. 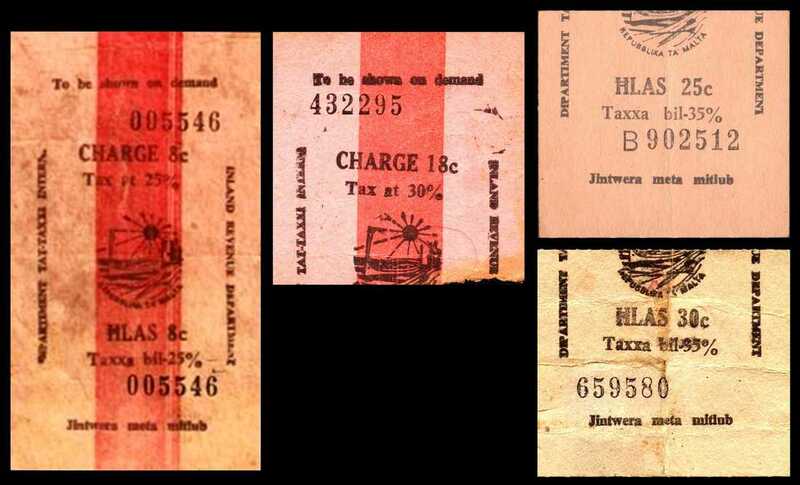 Alcohol Excise Duty Stamps. 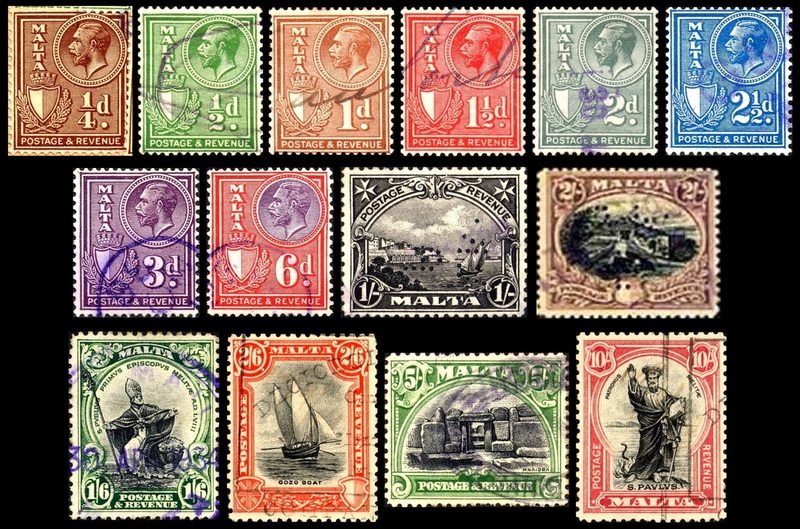 Various types and formats showing the Arms of Malta. All types incorporate a security hologram printed on metallic foil and a unique security code consisting of a letter and 8 to 10 digits. 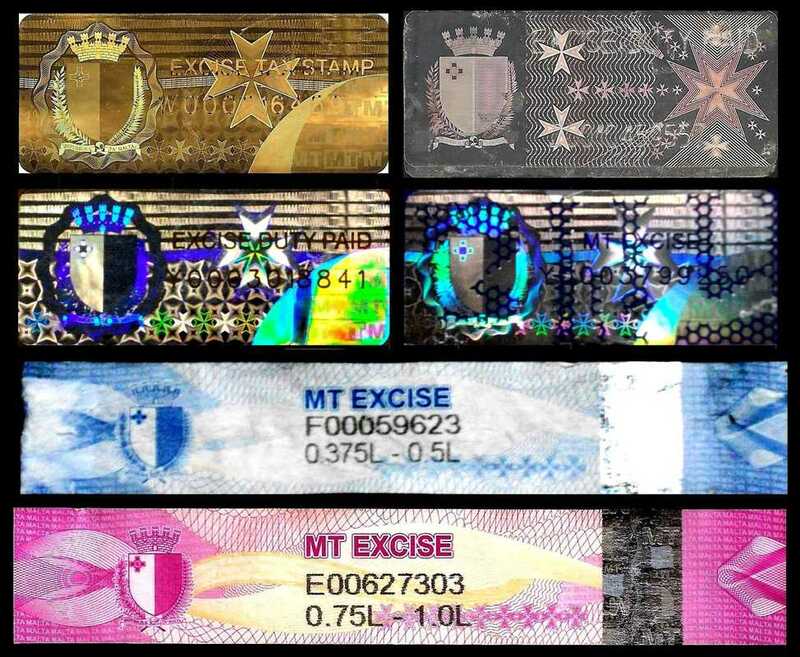 The silver labels inscribed EXCISE DUTY PAID (in a single line) are of two types - type A with two Maltese crosses in white to left of inscription and one to right, type B with one large Maltese cross in centre. ​1. I gratefully acknowledge the help of John de Battista and Carmel Axiaq for bringing X121/145 to my attention. The images shown here are from their personal collections. ​2. Carmel Axiaq states that the silver labels (X122/4) were introduced for taxes on spirits, while the remaining types (X121 and X130/145) were for taxes on bottles of wine. He records overlapping dates of usage as follows: X121 (2015-16), X122 (2008-14), X123 (2013-16), X124 (2015-current), X131 (2015-current), X141/5 (2015-current). ​3. . Security numbers have been recorded with the following prefix letters: X121 - W, X122 - Z, X123 - Y and Z, X124 - Y, X130 - F, X131 - E, X141 - C, X142 - B, X145 - A. ​4. Labels inscribed Denominazzjoni ta' Oriġini Kontrollata (=Protected Designation of Origin) or Indikazzjoni Ġeografika Tipika (=Protected Geographical Indication) are from wine quality schemes and fall outside the scope of this listing. No stamps are currently recorded as having been issued for vehicle licensing in Malta, though the two tax discs illustrated here (dated 1954 and 2006) may serve to launch some research into the field. The right-hand label carries the logo and security markings of the ADT (= Awtorità dwar it-Trasport ta' Malta, Maltese Transport Authority). 1929-42. Small numeral type with Maltese crosses in upper corners, inscribed WORKMEN'S COMPENSATION in circle surmounted by crown. 13 x 17½ mm. Perf 14 (W1) or perf 13½ (others). Wmk Multiple Script CA. Printed (recess) by Perkins Bacon. First issue: all stamps denominated one penny. Years of validity (taken from Malta Government Gazette, quoted by Grasham and Wood) given in brackets. 1. The 1d green perf 13½ (formerly listed as W3) has now been deleted since there is no clear evidence that this stamp was ever issued. The illustration of a 1d green in Grasham & Wood is now thought (Grasham private correspondence, February 2012) to show an example of W4 but with the colour incorrectly scanned. 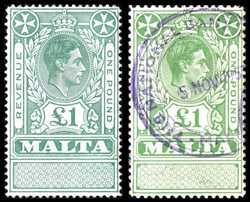 A 1d green was printed in 1943, but this was perf 12½ and is not known to have been issued without surcharge (for surcharged stamps see W17 below plus National Insurance stamps N1/2 and N4 above). 2. Imperforate proofs of the 1d olive-green are known on unwatermarked paper. 1938. As W5 but overprinted 1938-39 locally. 1943. First provisional issue. Postage and revenue stamp (King George V portrait) surcharged W.C.O. 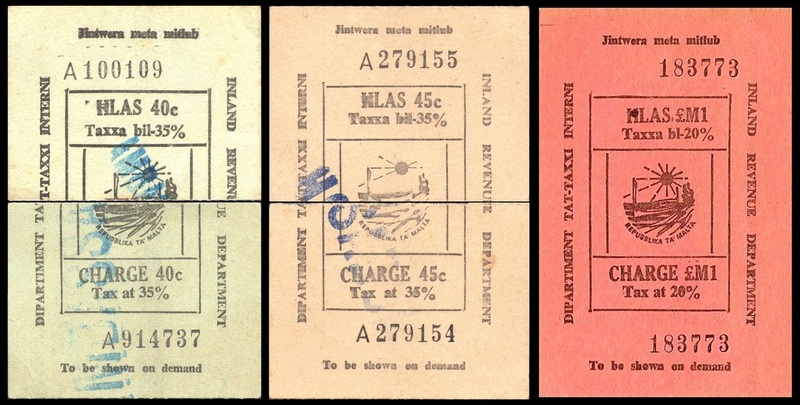 (=Workmen's Compensation Ordinance) 2d in black, with two bars through Postage and Revenue. Note: the introduction of 2d stamps reflected a change in procedure rather than a rate increase. 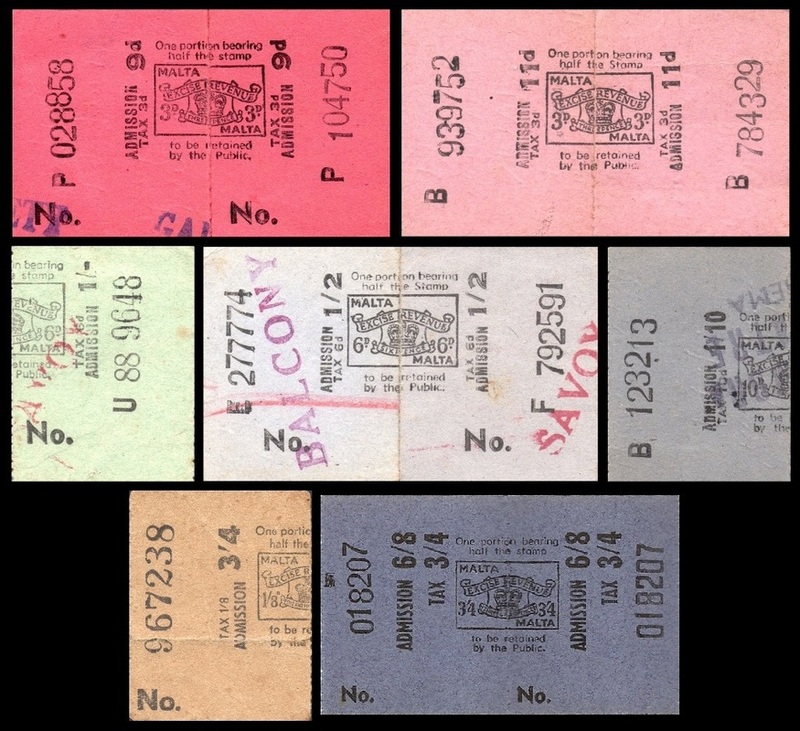 When the Workmen's Compensation Ordinance was introduced in 1929, the employer and the worker were each required to affix a 1d stamp in the receipt book every week. Whether because workers tended to forget this obligation or in order to save on requirements for printing adhesive stamps, the procedure changed in 1943 and from then it was the employer's responsibility to affix a 2d stamp every week, deducting half of this sum from the worker's weekly wage. 1943-45. Second provisional issue. As 1929-42 issue but surcharged 2d. in black, numeral 6mm high. Perf 12½ (W17) or perf 13½ (W18). Note: W17 is not known without surcharge (see also footnote 1 under W1/9). 1944-56. 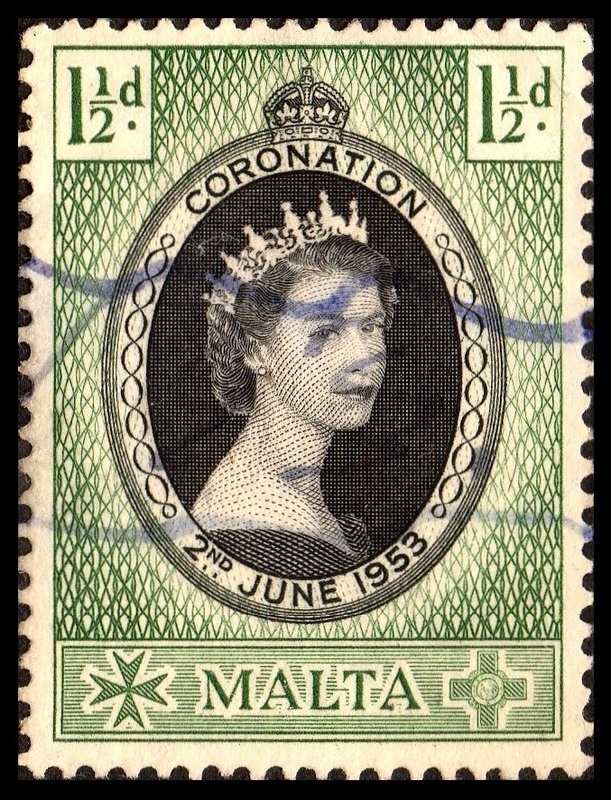 As original issue (W1/9) but value changed to 2d. 13 x 17½ mm. Perf 12½ except where otherwise noted. Wmk Multiple Script CA. Printed (recess) by Perkins Bacon. Years of validity (taken from Malta Government Gazette, quoted by Grasham and Wood) given in brackets. Note: W21, W24 and W27 can be distinguished by perforation as well as shade. I presume that the last two printings were also in light brown since the Requisition books do not specify a change of colour. Workmen's Compensation stamps were rendered obsolete by the National Insurance Act VI:1956. Their function was subsequently carried out using National Insurance stamps. Grateful thanks to Hadrian Wood, Nigel Jeffries, John De Battista and Carmel Axiaq, who provided a number of the illustrations in this section as well as additional information and help.